Cookie decorating is more than a hobby, it’s an art. With time and practice we develop a style and technique all our own. After four years of practice some of my “techniques” are so ingrained that they’re habit. One particular technique that seems to interest people is creating a invisible royal icing outline. I’ve done it for so long that I didn’t even notice until a friend pointed it out. This is what gives my cookies that seamless “poofy” look. 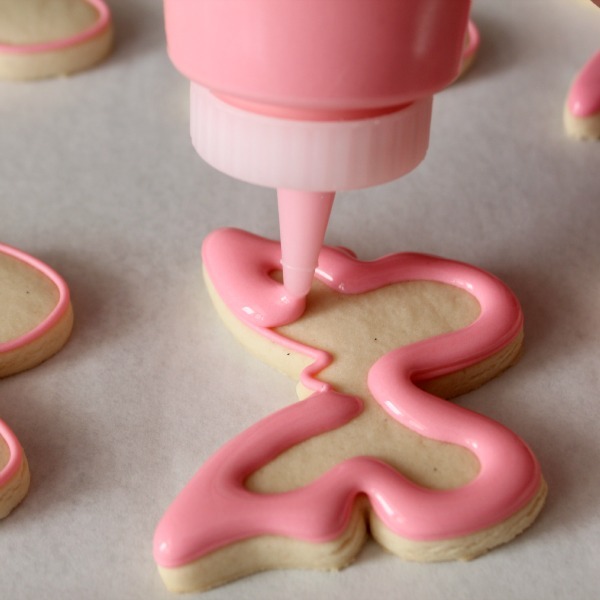 It’s a little tricky at first, but with patience you can create an invisible icing border too. Begin by outlining the cookie. I usually prefer a #2 tip. The most important elements of invisible royal icing outlines are icing consistency and an offset spatula. The icing must be thin enough to flow but not so thin it runs over the edge of the outline. There are variables such as climate and recipe that might affect consistency, but basically you’re looking for a something similar to honey or shampoo. It may take a little time to figure out what’s “just right” so don’t give up. Flood the cookie as pictured below, starting with the outline and moving toward the middle of the cookie. You want just enough icing that the outline is full but not so much it overflows. When the cookie is flooded, use an offset spatula to quickly spread the icing. The trick is to cover the outline without going over the edge. See? The outline is almost invisible from above. This is one of those things that’s a little easier to understand by watching, so in case you missed it on Facebook here’s the video version. 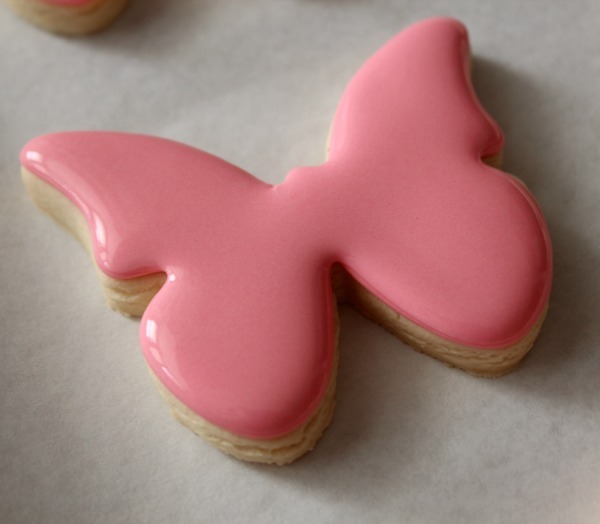 Since I don’t have the knack for making pretty butterflies, I relied on Al-Bee’s Bake Shop for inspiration. I’m almost afraid to share the original design as I may’ve butchered them a little, but this is what I was going for. Would you say this icing is close to your “twenty-second icing” and when you mention tip size, what brand are you referring to? Love, love, love your work. I’m just getting started trying to do some cookie decorating and you’ve been an inspiration as well as a tutor! I prefer Ateco tips, but the difference is so minimal it’s not that important. For the icing I’d say thinner than 20 second. Maybe between 12 and 15. But really, that’s just an guess. I’d go with comparing it to honey. That’s a lot easier than counting. I love your tutorials! Please do more videos! They are the perfect length and very easy to follow. Excellent read, I just passed this onto a celolague who was doing some research on that. And he actually bought me lunch as I found it for him smile So let me rephrase that: Thanks for lunch! I am going to try this and Your nails Look awesome! I’ll paint ’em next time! You’d be so proud! If there are any colors youre looking for let me know. Im getting rid of a ton of never used colors. Yours look better than mine LMAO! Also I tried this last night technique last night. Awesome and looks I didnt even outline. 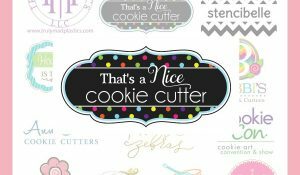 How I love to watch you work – if I were a cookie, I’d want you to decorate it! And it is *such* a pleasure, Callye! Thank you. I watched in amazement as you made short order of outlining/filling that cookie, and one-handed no less! Speedy and seamless! Wow. Cakes are my “thing” but I occasionally decorate cookies and I so appreciate your tips and tutorials! One day I hope to make cookies half as pretty as yours!! I also noticed that there is no visible line between the piping and flood of your cookies. It’s just another detail that makes your cookies look so flawless. I used to flood my cookies only using a squeeze bottle and using the tip of the bottle to spread the icing to the edges. But after a lot of cratering, I started to use the squeeze bottle to apply the icing and an off set spatula to spread it. It got rid of the cratering, and as an added bonus, using the off set spatula made the piping outline invisible! Thanks for sharing so many amazing tips, tricks, and ideas. You’re a true inspiration! This is the most perfect color of pink ever! And the most gorgeous butterflies ever! And such an awesome technique! It’s really so clever and they look so smart and flawless! I need to learn how to do this! Thanks for this tutorial! I was wondering if there was a trick to invisible outlines, so this is very helpful! Love how pretty the butterflies turned out. By the way, I wanted to let you know that I made a batch of Hawaiian shirt cookies inspired by your tutorial. I really appreciate how detailed and thorough your tutorial was. I’m pretty new to cookie decorating, but your steps helped me create some really cute cookies! Thank you so, so much! 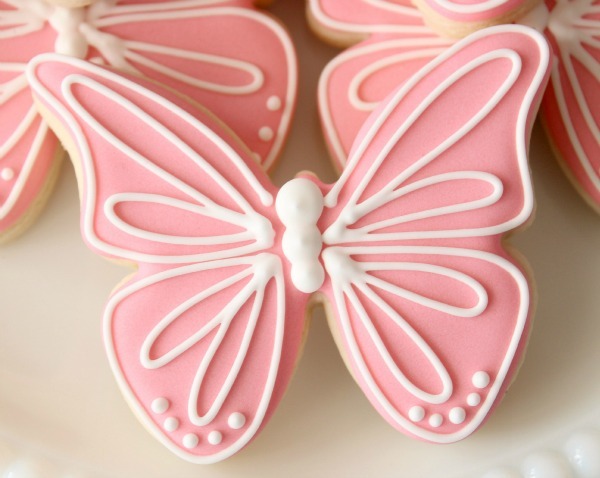 Your cookies are beautiful!!! But, I HATE the taste of royal icing – too chalky. Wish there was an alternative icing that behaved the same way. Erin – I used to think the same thing, but I don’t anymore. 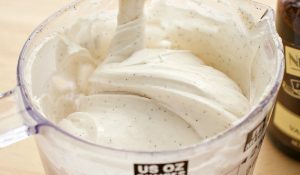 Once I started using Callye’s recipe and guidance for royal icing, an off flavor or consistency was no longer an issue. I enjoy making a nifty looking cookie, but in the scheme of things, the flavor is the most important thing. After all the work, I certainly didn’t want to find a cookie in the garbage. Using Callye’s recipes solves that issue wonderfully well. When I make Callye’s cookies, I always hear compliments on how good they taste. Don’t lump royal recipes in one basket. Try Sweet Sugar Belle’s recipes for success!!! Not sure if I missed it, but can I have the link to Callye’s recipe? 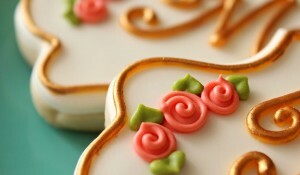 Jeanne – The Royal Icing recipe can be found under Recipes on the top tool bar. It’s also a good idea to use the Search field. My observation of the Sweet Sugar Belle site is that it is very complex. Callye does a great job of adding links within a post, but really that doesn’t always cover what you need or may be interested in. My recommendation to read quite a number of posts over the four year life of this blog to get a sense of how it is all organized. If you depend on links you can miss a whole lot of great information. And, then use the top tool bar and search. Also, sometimes I will even copy the list of titles and paste into a Word document and then print it to read at my leisure. This way I can understand how Callye names her posts and zero in on something I would never find otherwise, that is interesting because of the title alone. This blog is simply loaded with information. Don’t just depend on the current post to give you all that you need. This blog is an outstanding manual for both the newbie and for the experienced, and even the professional. I am anxious to try your tip with the offset spatula. This might seem like a silly question, but do you wipe your spatula off after each cookie? If so, what do you use to wipe it off with? Your invisible outlining video were my AHA! OMG! and ARE YOU KIDDING ME?! moments all rolled into one! 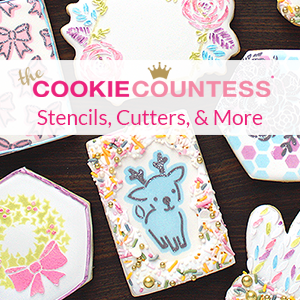 I’ve only been cookie decorating since Christmas and have been struggling for “perfection” with outlining and flooding – you have no idea how much your video will help! I can’t wait to apply your technique with my next batch. Thank you, thank you, thank you1 Your sharing of information and tutorials are so appreciated by this novice! Do you outline a few and then go back and flood or do you outline and quickly flood one at a time? Thank you so much for answering!! It doesn’t really matter. It just depends on how many cookies I’m working on. Usually I outline them all and then go back and fill. What a great tutorial! Thank you! I had given up on cookies bc I just couldn’t get that look I wanted, this will help tremendously. 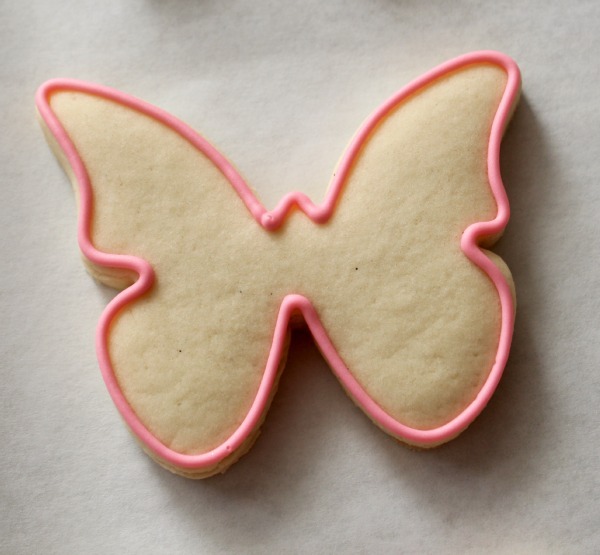 Can you share a link to your icing recipe? or is it secret? 🙂 Thanks for the tutorial either way! I love your clean crisp lines. I don’t know if I missed it , but is your outlining icing the same consistency as the flooding ? I’m thrilled to have mastered the flooding technique, however, I’m getting tiny bumps. I outline with a slightly thicker icing, followed by flooding and use then a popsicle stick to spread icing, next I use a molding tool to pop any large air bubbles. I’m still getting teeny tiny bumps all over all the cookies- can’t figure out why:( any ideas??? YES! I was wondering how you mastered this! It certainly gives the cookie a beautiful, finished effect. Thanks for sharing ;)! Of course I love the technique but my favorite part of the video was when you said, “quick….ly”. In our home, catching someone forgetting the “ly” ending is almost a competitive sport. Small world. Though I am now retired behind the “Pine Curtain” in East Texas, I grew up in West Texas with a mom who was a teacher. Dad worked on an oil crew, we moved yearly and lived in tiny little towns such as Monahans, Fort Stockton, Big Spring, Brownfield, etc. It was a wonderful place to grow up and I still miss the tumble weeds, devils claws, horny toads and other desert creatures. Thunderstorms rumbling across the plains are beautiful but I don’t miss the dust storms and flash floods and will happily go through life without stepping on another goat head! 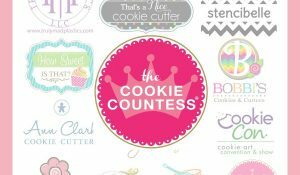 I’m enjoying your site, learning so much about decorating and will be thinking very kind thoughts about you while working on this year’s batch of Christmas cookies. Great web site. A lot of helpful info here. I am snindeg it to some pals ans also sharing in delicious. And of course, thank you to your sweat! Thank you for sharing your techniques an recipes. We love your no refrigeration sugar cookies. They are delicious! I love your butterflies! They are pretty & simple, just my style. Off to see if your site gives tips to rolling cookies out to a 1/4of an inch. I am having trouble with my icing, it does not dry glossy. If I use egg whites or meringue powder for my royal icing it is always dull when it dries. Do you have any advice? I am having trouble with my Royal Icing. It doesn’t matter if I use Egg Whites or Meringue Powder the icing always dries dull instead of glossy. Do you have any suggestions? What is the average dry time before adding the white outline on the butterflies? In west Texas 2-4 hours. In other places it can be anywhere from 8-24hrs. 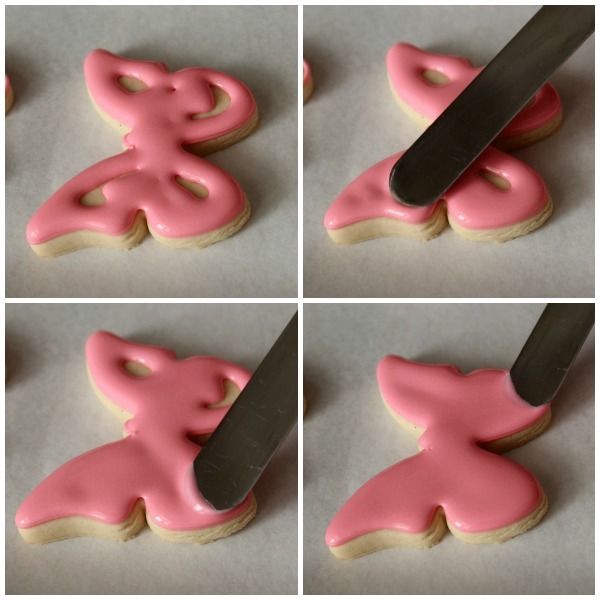 where did you get the butterfly cookie cutter? When I outline my cookies and try to back in and flood, my icing starts to stiffen, almost crust, so quickly so I don’t get a smooth icing look. What do you think I could be doing wrong? Any advice would be GREATLY appreciated! Do you keep it in a sealed/covered container? What royal icing recipe do you use? So can you give a rough estimate on what timing the flood icing would be? I use royal icing at work. I ice tons of cookies weekly. Your technique of icing seems incredibly slow. I ice using the backside of the skinny spatula. The icing spreads out and smooths nicely without any bumps or ripples. I never outline then flood. I’d post a picture of the cookies I’ve done but I can’t in this email. Any way, thats my 2¢. Kelly, where can I watch your icing technique? Or your cookies? Please please please answer ! whick pink did you use in tihs video ? i want to buy !!! its really adorable . I want to buy a pink without purple, a warm pink like this. I have to order this evening please anwer immidiately, thank you so much ! I was just wondering what brand of piping tips do you use? Hi – I’ve been enjoying your site and reading everything. Thank you for sharing your knowledge. May I ask if you can put up your video again on Youtube for flooding with no borders showing. When I click on the link it says the video is unavailable. Thanks again for sharing! Is the above video anywhere else? It says “Video Does Not Exist” when I try to play it. I did not notice it on your youtube channel, either. SOMEDAY….I hope to master outlining and flooding, fingers crossed. Video isn’t working, is there somewhere else to view it? I love you work and follow each one. I’ve learnt a lot just watching you! I have a question, do you use the same icing for outlining and flooding? I usually prefer to use two different consistencies, but you can use one consistency for both. 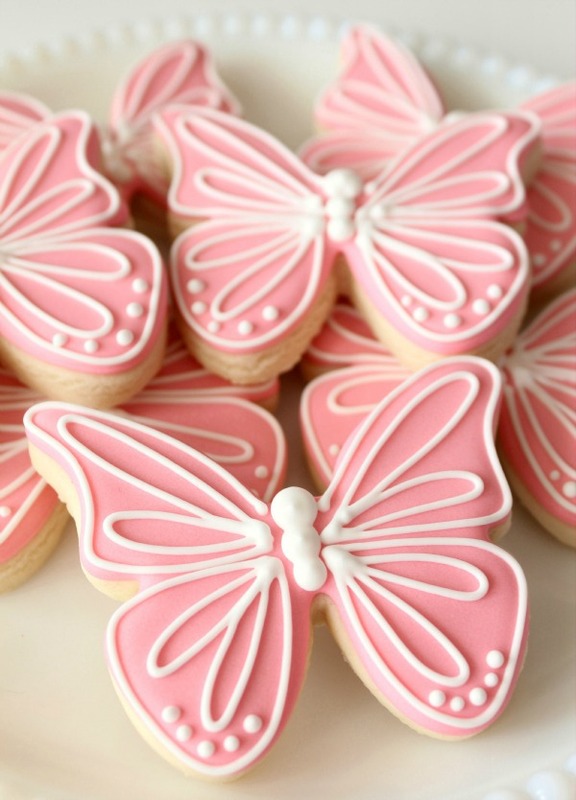 Well my dear i looked at the original idea for your butterflies…….although they are lovely i like yours better they look more delicate…….there is less going on on your cookie and that makes them elegant i think. You most certainly not butcher your cookie. Love your knowledge that you share……thank you. Why are the videos unavailable?